Packed full of Omega 3 essential fatty acids, salmon is a great addition to your baby's diet. It has a whole host of benefits from brain development to preventing excema. This easy cheesy salmon recipe was a hands down success with my little one. If you make up a batch of cheese sauce in advance, this is a speedy recipe you can throw together in next to no time. Blitzed up to a purée, it's perfect for babies from six months. Older kids will also enjoy this if you just flake the fish and leave chunky. Some lovely mashed potato on the side is a perfect accompaniment. I've also added carrots and broccoli to this recipe for extra vitamins and the onion and celery gives it a great flavour base. Place the salmon fillets in a dish with the butter. Cover with cling film and pierce a few holes or use a lid with a gap. Flake the salmon and remove any tiny bones. 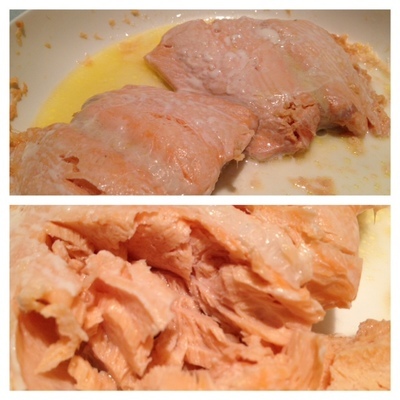 I buy my salmon without skin or bones but it's always a good idea to double check as you flake the fish. Dice the onion and celery finely and then fry until soft in a little oil. Meanwhile, finely chop the carrot and steam with the broccoli florets until tender. Add the carrots, broccoli and salmon flakes to the onion and celery, giving it a good mix. For younger children you can either mash or purée this mix or leave as it is for older kids. Add the cheese sauce and milk, giving everything a good mix. The recipe can be eaten without cheese sauce but adding it, gives some great flavour, lots of calcium and a lovely consistency.